Proving that you don’t have to be a twenty-something model to pull off a gamine crop, Dame Judi has had a short style since the 1960s. Does she ever think of doing anything drastic to tackle the ageing process? ‘I’ve never had anything cosmetic done to my face,’ the actress revealed in a recent interview. ‘Do I want to? Of course! I’d love to go right now and come back with completely smooth skin. I want everyone to say: you must be 39! Good job then that her famous cropped hair keeps her looking so fresh and fabulous, without a scalpel in sight. ‘I was lucky enough to do Judi’s hair for the front cover of a magazine,’ says Gary France, International Education Manager for Toni & Guy and Essensuals. Perfect for: Any hair type. ‘This ageless style works best on those with soft features,’ says Gary. Judi has high cheekbones and arched brows, which help her carry the look. This cut suits naturally grey hair with ash tones. Ask for: A textured pixie cut. 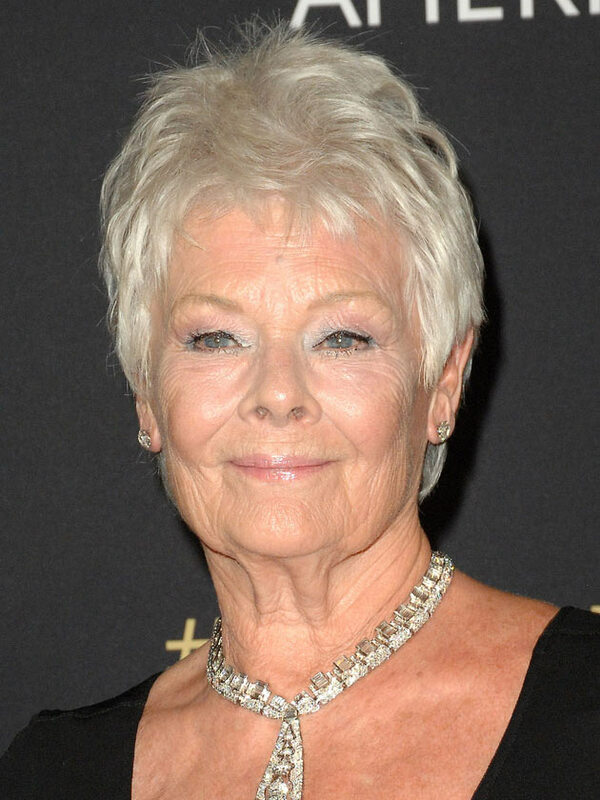 Leave the length slightly longer, like Judi’s, to keep it modern and fake fullness in fine hair. ‘Judi likes her hair short but still feminine with a little texture,’ adds Gary. Shorter styles require a bit more upkeep so book in for a trim every four weeks. As hair goes grey, we can lose warmth from our complexions. Well-placed highlights around the face – like Lorraine’s – will bring colour to a pale or sallow skin tone. Perfect for: Dull skin in need of a pick-me-up. Highlights also create the illusion of fullness on thinner locks. Ask for hair for my face: The balayage technique, which involves painting on colour freehand to give a really natural, sun-kissed result – and it’s totally bespoke to you! A balayage pro will pick a shade to suit your skin and hair colour and place the pieces strategically to totally light up your features. Snip in a fringe and shave off a couple of years. As Davina shows, it’s a perfect disguise for frown lines and draws attention to your eyes instead. Perfect for: Large foreheads and longer face shapes. Fringes are easier to style on straight and wavy hair, so best to avoid if yours is very curly. Ask for: A feathered fringe that tapers down at either side. Your stylist will choose a length to suit you. Sweeping your hair back – as seen here on Emma – allows light to flood in and brighten your face. The height has a lifting effect, too. Perfect for: Rounder faces. This tall style draws the eye up to slim the face. It suits all hair types and adds versatility to fringed styles. Ask for: A bit of backcombing on top with slicked-back sides. This style is so simple you can easily do it yourself at home. The shaggy graduation adds plenty of body to Jennifer’s style, both at the roots and through the lengths. Perfect for: Boosting flat, lifeless locks. This layered cut works well on thick hair as it encourages texture. Avoid layering if you have thin, fine hair – a blunt bob works best for you. Ask for: A long bob with lots of layers and some face-framing pieces at the front. This is the 2.0 version of the classic bob. It’s cut at an angle so it’s shorter at the back. The longer pieces around the front hug the face and jawline for a super-flattering effect, as Dawn shows. Ask for hair for my face: An asymmetric bob. Your stylist will tailor the length to suit you. If your hair is thick, ask for the ends to be thinned out slightly.